Originally enlisted in 64th Illinois Infantry, F&S. Captain Alexander Cameron requested permission to be absent from his command for 30 days to take the remains of his brother, James C. Cameron, who was killed in the engagement at Barton Station, AL 17 April 1863, to the family burial ground at Ottawa, IL. Leave was approved. Alexander Cameron was born on 5 April 1840. After emigrating from Scotland, he settled in Ottowa, IL. After the war, he moved to Santa Barbara, CA in 1875 where he was an attorney. He died 17 December 1877 and his grave is marked with a military headstone marked "Co. C, 1st Alabama Cav." He left a widow, Nancy, and one child. His obituary described him as "Lieut. Colonel." 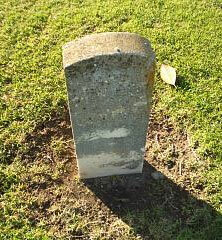 Headstone is covered with lichen and is nearly unreadable. Picture submitted by Dorothy Oksner.